If you’re looking for an Easter activity to do with your children this weekend, here are a few quick ideas. You can quickly cut some eggs out of your white computer paper and set the kiddos loose to decorate them. Give them watercolors for some colorful painted eggs. Add a white crayon to allow the children to create hidden pictures first, as the wax will resist the colored water. You might even make the crayon designs yourself and have the children find them as they paint! Place the paper eggs in a shoe box and add paint and a few marbles and golf balls and let the children roll them about for some fun action painted eggs. You could also cut your eggs out of paper towels and try this great technique using markers and water. Don’t throw away those plastic eggs after your hunt is over! Use those extra plastic eggs to create shaky eggs! 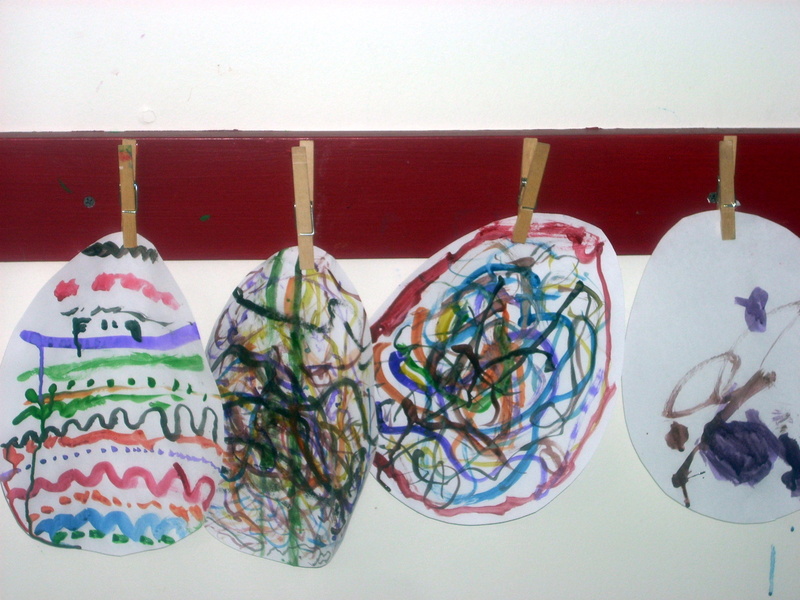 Follow these directions to make egg shakers with your children and then let them decorate them with stickers. Use them to dance to your favorite tune, or try I Know a Chicken by Laurie Berkner (my favorite shaky egg song)! You could also build some auditory perception by making those egg shakers with different objects inside and playing a matching game as I explain here. Now, not everyone celebrates Easter, and those that do have many different ways to do so. Not everyone can use the egg ideas, but these painting techniques can be used on ANY shape of paper, so make it fit your needs! And anyone could use an egg shaker for an instrument, and with the abundance of materials right now, you could make enough to outfit an entire class or playgroup for next to nothing!